Edwards Stadium is the best facility in northern California, according to TFN editor Garry Hill. Our fifty-part series now goes to the west coast. California is so big that it really should be two states, and that’s how I’m treating it: NorCal and SoCal. Today we look at the northern part of the state. At 22,000 capacity, Cal’s Edwards Stadium is the largest stadium with a track in northern California. Opened in 1932, it used to host everything: the NCAAs (eight times! ), the US championships, and international duals such as the USA vs USSR. So far as I know, its record attendance is a sellout 22,000 for the second day of the 1971 USA-USSR dual meet. Edwards Stadium is by far the largest track-specific stadium in northern California, and just barely beats out Sacramento State’s Hornet Stadium (21,195) as the largest, period. Hornet Stadium hosted many major events in no small part due to its having an immediately adjacent warm-up track – there might be just two other tracks in the USA with that kind of setup – but Berkeley High School’s track, just a few blocks away, could do the same for Edwards if it ever again hosted a major championship. 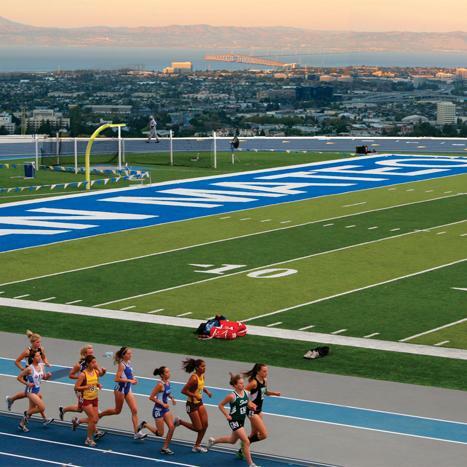 The College of San Mateo’s College Heights Stadium has some views that are hard to beat. An earlier version mistakenly called it Bulldog Stadium. Honorable mention goes to Humboldt State’s Redwood Bowl, because redwoods. Opened in 1921 for both football and track, the track was removed from Stanford Stadium in 2005. 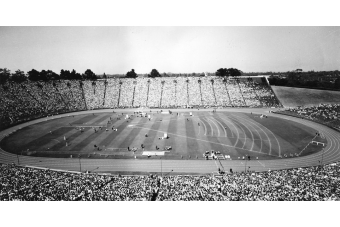 It hosted the largest crowd ever to come to a track meet in northern California, the 81,000 fans at the final day of the 1962 USA-USSR dual meet, which is also the largest non-Olympic attendance in American track and field history. Vin Lananna’s first stab at a “big idea” in promoting track and field was his bids for the 1999 and 2001 IAAF World Championships, which would have been held here. Pretty cool stuff! Have you written about others, maybe touring the South? I’ve run in Master’s meets in Knoxville, with a real Track scoreboard, and Clemson, a 10-lane track! In good time we will get to all 50 states. I’m posting six per week. I really like this series. Maybe you could add some honorable mentions in future editions/states, for NoCal I think Stanfords current track deserves a little place in this list and I really liked Kezar stadium in SF when I saw it during a run in Golden Gate park.